Lest I be accused of burying the lede, let me begin by saying this is the story of how I was added to the speaking roster at an upcoming Faith and Innovation Summit. I have a friend named Sam. He’s a Jesuit. Sam and I met in college, but we didn’t know each other well. We reconnected at a friends wedding a few years ago. It was an Advent wedding. I wore a purple shawl and purple eye shadow in honor of the liturgical season. Despite all this, my new/old Jesuit friend chatted with me throughout reception. About a year after that, Sam asked if I had time to throw some ideas around about evangelization and new media. I thought “geez, I’m not really sure I know what either of those terms means” but agreed to talk on the phone and see if I could fake it. We had a very productive conversation, in which I startled myself by having something to contribute. It was then that I first admitted that sometimes I blog “for people who were disappointed by the homily that weekend”. More importantly I started to identify the ways that I use media, in the many forms I have available to me, for evangelization. It’s not so much that I fall over myself to spread faith, but that I can’t not do it. Just like I can’t keep my feelings from being written all over my face, I can’t keep my religious convictions from being written all over my blog (even when I’m writing about books or feminism or soup). Sam went on, with other SJs, to found The Jesuit Post, an up and coming web resource for which I am happy to shill. It’s pretty amazing. He recently introduced me to another entrepreneurial Catholic, Adam Coughlin, who founded Plus Grace with his brother. 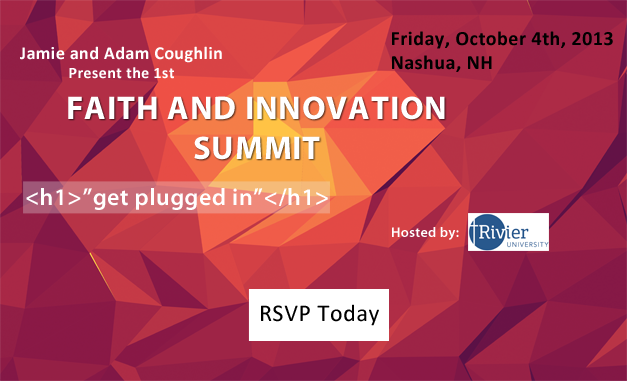 They are hosting a Faith and Innovation Summit on October 4 in New Hampshire, and I’ll be one of the speakers there. If you are in or around New England, you should consider coming to the summit. There is a killer group of speakers (including the aforementioned Sam), and lots of time built in for getting to know other people searching for new ways to set the world on fire. I didn’t know that’s what I was doing until I started talking to someone else about it. If you feel passionate about spreading your unique message using all the new tools we have available, know that you’re not alone, and that we all have lots to learn from one another. Maybe you can’t make it to New Hampshire on a Friday. We’ll miss you, but I should be able to share both what I present and what I learn at some point after the fact. If you decide to join us, make sure to let me know you’ll be there! Edited to add: Unfortunately the summit had to be postponed until a later date. We’ll let you know when that is!. Looks like a great conference! Is it possible to capture the presentations on video? It would be great to have them available on YouTube and possibly include excerpts at The Jesuit Post (great way to make it multi-media:-). In any event, look forward to hearing more about it. Yes! The organizers plan to record the presentations, so when those videos are all up I’ll be sure to let you know where to find them!